Fildes Roofing Ltd is a well-established family roofing company based in Sussex. We have over thirty years’ experience working on a variety of projects, ranging from individual bespoke properties, heritage work and new build sites of up to 300 units. We work across the South of England including Hampshire, Berkshire, East and West Sussex, Surrey and Kent. The company has a dedicated and expert staff with the aim of delivering quality with service. All our roofers are trained and qualified to at least NVQ Level 2 or Level 3, and have relevant CSCS health and safety cards. We offer services in tiling, slating, shingling, stone slating, lead work and general roof repairs for domestic properties, and specialist roofing works for heritage and ecclesiastical buildings. For each project, we provide written quotations outlining the works. We are also happy to provide our clients with advice on their specific roofing concerns. Get in touch to find out how we can help you. The company has public liability insurance and an up-to-date Health and Safety Policy, and is a member of the National Federation of Roofing Contractors and the NFRC Competent Roofer Scheme. Roof on a new-build using Cotswold random stone and a variety of lead works. The project was completed in 2009. Fildes Roofing Ltd were Finalists in the NFRC Roofing Awards 2015 in the Plain Tile category with the re-roofing works carried out to a property on a marine estate near Bognor Regis, West Sussex. Fildes Roofing Ltd were Finalists in the Construction News Roofing Awards 2013 category with their work on Watts Gallery, Compton, Nr Guildford, Surrey. Fildes Roofing Ltd were Finalists in the NFRC Roofing Awards 2013 in the Roof Tiling category with their work on ‘Moongate’, West Wittering, West Sussex. Fildes Roofing Ltd were Runners-up with a Certificate of Merit for Excellence in Roofing at the National Home Improvement Council Awards 2013. Fildes Roofing Ltd carried out the reinstatement of the roof tiling to Tindalls Cottage, at the Weald & Downland Open Air Museum, Singleton, Nr Chichester, West Sussex, using re-claimed clay peg tiles and new Keymer clay peg tiles. The tiles were fixed with chestnut pegs and laid to chestnut laths supplied by the Museum. 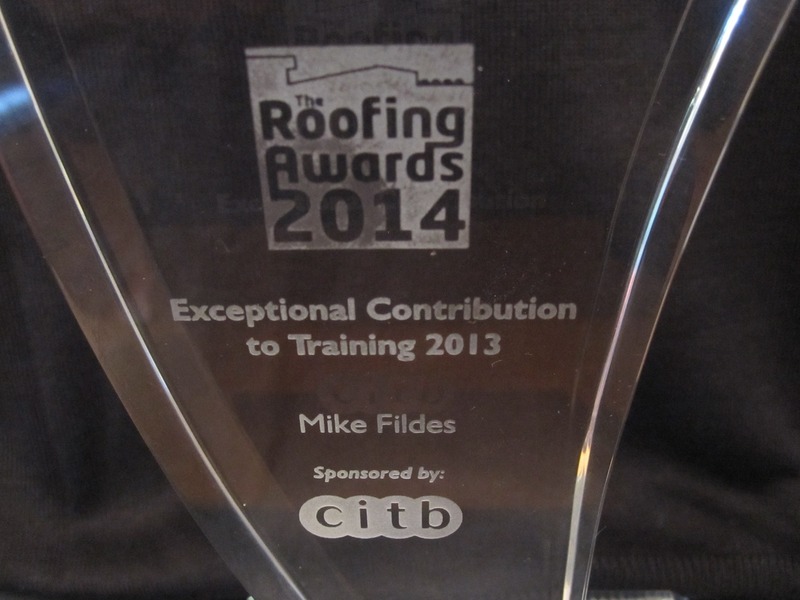 Congratulations to Mike Fildes, Managing Director of Fildes Roofing Ltd and South Coast Roof Training Ltd, on receiving the award for Exceptional Contribution to Training in 2013, sponsored by the CITB, which was presented by Linda Barker, TV presenter and interior designer, at the NFRC Roofing Awards 2014.